George Dangerfield was the master of the interregnum history. His mordant wit and his keen eye towards specific events that triggered political movements are very much worthy of study today. It was a picnic-perfect summer in 1914. The rich flaunted their wealth with all the subtlety of rats leaping onto a pristine wedding dress. The newspapers steered their coverage away from serious events to pursue lurid items about sports and celebrity gossip. A comic double act by the name of Collins & Harlan recorded an absurd ditty called “Aba Daba Honeymoon,” which Thomas Pynchon was to describe fifty years later as “the nadir of all American expression.” Few human souls twirling their canes and parasols in these conditions of unbridled frivolity could have anticipated that an archduke’s assassination in late June would plunge Europe into a gruesome war that would leave twenty million dead, permanently altering notions of honor, bloodshed, and noblesse oblige. But even a few years before the July Crisis, there were strong signs in England that something was amiss. Politicians demonstrated a cataclysmic failure to read or address the natural trajectory of human progress. Women justly demanded the right to vote and were very willing to starve themselves in prison and burn down many buildings for it. Workers fought violently for fair wages, often locked into stalemates with greedy mining companies. They were intoxicated by a new militant brand of syndicalism from France then popularized by Georges Sorel. The atmosphere was one of increasing upheaval and escalated incoherence, even among the most noble-minded revolutionaries. The influx of gold from Africa inspired both lavish spending and an inflated currency. The liberals in power were supposed to stand up for the working stiffs who couldn’t quite meet the rising prices for boots and food and clothes with their take home pay. And much like today’s Democratic Party in the States, these tepid Parliamentary wafflers past their Fabian prime revealed a commitment to ineptitude over nuts-and-bolts pragmatism. They allowed the Tories to play them like rubes losing easy games of three-card monte. Amidst such madness, England became a place of oblivious tension not dissimilar to the nonstop nonsense that currently plagues both sides of the Atlantic. With the middle and upper classes keeping their heads in the clouds and their spirits saturated in moonbeam dreams and a bubble gum aura, is it any wonder that people were willing to incite war and violence for the most impulsive reasons? [I]t was just as if some unfortunate miracle had been performed upon its contents, turning them into nothing more than bits of old iron, fragments of intimate crockery, and other relics of a domestic past. What could be the matter? Liberalism was still embodied in a large political party; it enjoyed the support of philosophy and religion; it was intelligible, and it was English. But it was also slow; and it so far transcended politics and economics as to impose itself upon behaviour as well. For a nation which wanted to revive a sluggish blood by running very fast and in any direction, Liberalism was clearly an inconvenient burden. Dangerfield knew when to let other people hang themselves by their own words. The infamous Margot Asquith, the starry-eyed socialite married to the Prime Minister who led England into World War I, is quoted at length from her letters to Robert Smillie, the brave union organizer who fought on behalf of the Miners’ Federation of Great Britain. Asquith, so fundamentally clueless about diplomacy, could not understand why meeting Smillie might be a bad idea given the tense negotiations. 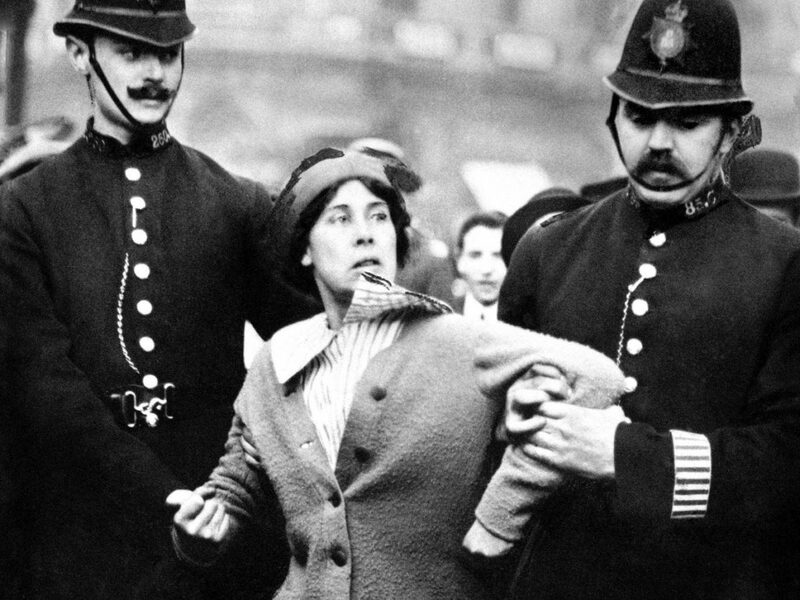 I did feel that Dangerfield was unduly harsh on Sylvia Pankhurst, one of the key organizers behind the suffragette movement. His wry fixation upon Pankhurst’s indomitable commitment — what he styles “the fantastic Eden of militant exaltation” — to starvation and brutality from the police, all in the brave and honorable fight for women, may very well be a product of the 1930s boys’ club mentality, but it seems slightly cheap given how otherwise astute Dangerfield is in heightening just the right personality flaws among other key figures of the time. The Pankhurst family was certainly eccentric, but surely they were deserving of more than just cheap quips, such as the volley Dangerfield lobs as Christabel announces the Pankhurst withdrawal from the WSPU (“She made this long-expected remark quite casually — she might almost have been talking to the little Pomeranian dog which she was nursing.”). But it is clear that Dangerfield’s heart and his mischievous vivacity resided with his homeland rather than the nation he emigrated to later in life. In all of his work, especially the material dwelling on the United Kingdom, Dangerfield knew precisely what years to hit, the pivotal moments that encapsulated specific actions that triggered political movements. As he chronicles the repercussions of the June 14, 1911 strike in Southampton, he is careful to remark upon how “it is impossible not to be surprised at the little physical violence that was done — only a few men killed, in Wales in 1912, and two or three in Dublin in 1913; in England itself not a death. Is this the effect of revolutionary methods, and, if so, do the methods deserve the word?” He then carries on speculating about the pros and cons of peaceful revolution and ties this into the “spiritual death and rebirth” of English character. And we see that Dangerfield isn’t just a smartypants funnyman, but a subtle philosopher who leaves human possibilities open to the reader. He is a welcome reminder that seeing the real doesn’t necessarily emerge when you lock eyes on an alluring Twitch stream or a hypnotic Instagram feed. It comes when you take the time to step away, to focus on the events that are truly important, and to ruminate upon the incredible progress that human beings still remain quite capable of making. Next Up: John Keegan’s The Face of Battle!